Raw Truffles, and Rhubarb Salsa – Guest Blogger Amanda! My guest poster and I!! I found a photo of us!! Yay! Yay! 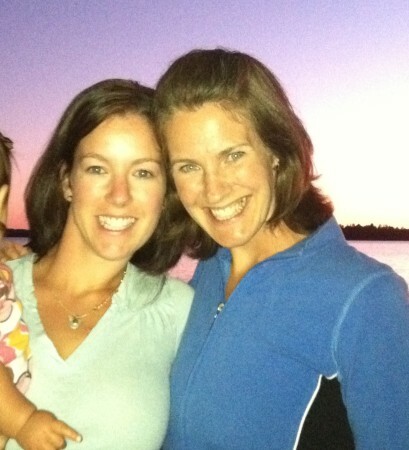 My sister Amanda is in charge of today’s post! Amanda is an amazing person, mom, and sister who would never recognize just what a compassionate, passionate, and talented person she is! Pre kids she was a rising star in corporate america, then made the difficult decision to stay home with the kids after moving with her family across the country (too far for my tastes). She is always striving to better herself her community and her family and I am so proud to present her first blog post!! More to come, I hope!!! My sister Jodie convinced me to do a detox with her a couple weeks ago, assuring me that it would be no problem considering we had done a fast before (about 100 years ago, before kids! Which, if you have kids, you understand is a big difference.) I was nervous but figured I could do this for me! Could I have taken the easy way out and just gone to get my nails done like a normal mom would do for her “me time?” Of course but giving my body a rest was a great way, a deeper way, for me to say thank you to my body for the last 33 years it has gotten me through. This detox took a lot of work going into it because of all the food that needed prepping and buying. I hadn’t thought about my meals so far in advance since, well, never!, but I realized when I did think about it in advance and had the right ingredients in my kitchen I could make healthier choices and it really wasn’t that much work with the right recipes and google. 1. I own the coffee and the coffee doesn’t own me. Nina, our detox leader, made a good point in saying, do you miss coffee or the ritual of it? I missed the ritual of holding that hot cup but not having that creamer every morning or the caffeine/sugar crash in the afternoon. It is a great trade off having energy regardless of my morning beverage and I still enjoy coffee just not everyday. This may sound weird but it is empowering to have control over my cravings. 2. How to make a smoothie with out all the dairy. Maybe your body likes dairy but mine, not so much. Amazing that a cup of water and some frozen or fresh fruit/veggies can make a great smoothie along with a little chia seed and hemp seeds. I didn’t realize it was so easy, and the whole family loves them, we just need to floss more often with all those seeds. I still enjoy my smoothies in the morning post detox, just usually the fruit ones and not the green ones, I am human after all. a.) how much I pick at food at I make it. c.) that I forgot what it feels like to be hungry and it is okay to feel hungry. 4. Dessert can be delicious and healthy sometimes. Dates were an untapped ingredient for me pre-detox. 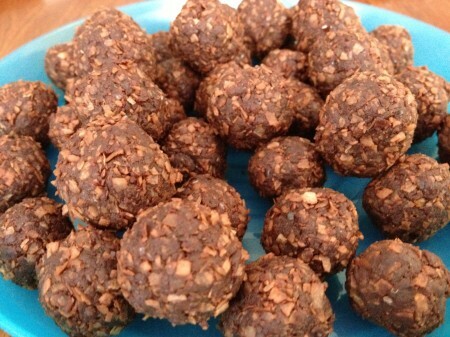 I have a feeling it will become a regular ingredient after enjoying the coconut cocoa truffles with dates on the detox. My son just quizzed me this morning, “why are there only four coconut balls left mom?” I didn’t know he was keeping track! Yikes, I better make more! 5. Food costs money! This detox cost me a lot of money just because all those healthy spices and staple foods were new to my cupboard and were not cheap. When I bought them I could hear Jodie’s voice in my head telling me how little Americans spend on food, the one big way we can control our health, and we don’t want to spend the money on it. I told myself I would spend the money just for this week. The funny thing is that it isn’t that expensive to buy fruits and veggies as long as I am not buying frozen pizzas, and all the other prepackaged and over processed foods too. So post detox, my grocery bill is not that outrageous. 4. Post detox I noticed my rhubarb was fully grown and needed some cutting but when I went to find a recipe all I could find were recipes with lots of white sugar and white flour which didn’t really seem so appealing after all that work. I found this great rhubarb salsa recipe and I still get to enjoy the rhubarb minus all the sugar. I am not saying I won’t make that rhubarb crisp sometime this summer but I am caring about my health just a little bit more and think it is worth the time to plan and make good choices. Here is to taking care of more than just my family, here is to taking care of me. Process all ingedients in a food processor until they stick together. Great new take on salsa! I know a few rhubarb plants that will gladly turn into salsa! 1. Bring a pot of water to a boil over medium heat, and stir in the rhubarb; simmer for 2 minutes to blanch. Drain in a colander set in the sink and let cool. 2. 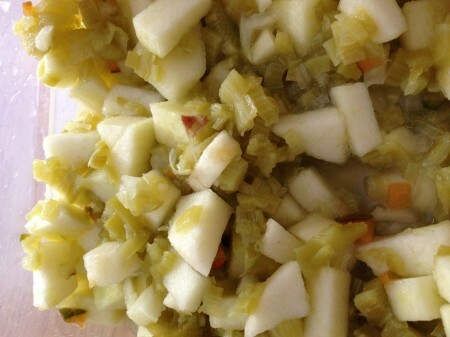 Stir together the cooled rhubarb, apple, green onion, lime juice, honey, and jalapeno until thoroughly combined. Make sure mix is thoroughly cooled (2hours.) so peppers have a chance to mellow out. Serve with tortilla chips or on fish or chicken tacos!